We were able to finish up the Animal Room aka The Happy Room this past weekend. Whew. What a relief. I think it was our biggest undertaking since buying our house. We are VERY pleased with the results. The color is just what we had pictured. On Sunday night we moved Elwood and Herbie into their new room. Since we removed the wall of cabinets we've been on the lookout for some sort of cabinetry/storage/buffet to put in the room. Something we could put the terrariums on. I'd like something that fit into the room (simple, not ornate, possibly modern looking) and would even love to reuse or refinish an item. Not to mention, I don't want to spend a huge amount. Sita was so gracious to donate an old apothecary/canning table for Elwood...exactly what fit the bill. We're still on the lookout for a storage space and something to put Herbie on. In the meantime he's on the hope chest/coffee table that's already filled with items from the wall cabinet. 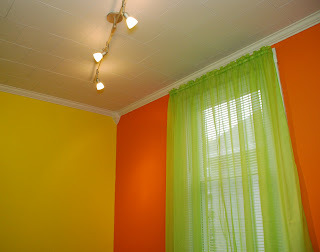 I attempted to take photos but they do not do the room or color justice. It's not as bright/vivid in the pictures. And given the size of the room it's hard to get good photograph angles. But, I tried my best. 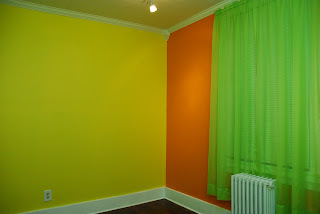 First, when we moved in, this is what the room looked like. 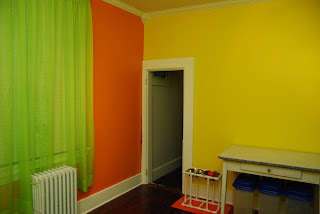 Paneling, carpeting, 70's curtains/lighting, and plywood wall cabinets. 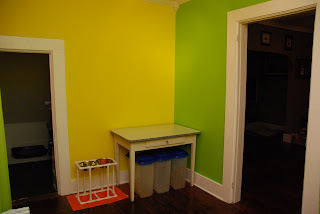 Between then and now we painted the cabinets but ultimately decided they needed to go. Now, after the renovation.....Carpeting gone and hardwood floors refinished (done in 2006), plaster gone, drywall installed, new curtains, and track lighting installed. Very nice...I am sure the kids will love it.